Letter W week was Wonderful, Wild, and particularly WaCkY (especially on Wednesday). Read on below to hear about the fun that was had during Letter W Water Week! On Monday and Tuesday morning, the students began the day by working on their letter W tracing/writing activity sheets. The students worked diligently and as usual were in good spirits even in the face of a challenge. For some of the older students in the school, free-writing the letter W proved to be quite difficult. The students kept writing the letter M instead! Fortunately, the students were able to fix their M’s and write the W’s but one student in particular had the teachers really laughing. When reminded that a W was the other way around, the students looked puzzled for a second and then flipped his paper around and said, “Now it is like a W”. The teachers gave him credit for his creativity and for thinking outside the box! 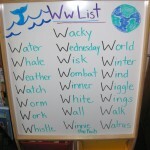 In the afternoons, the students compiled a very extensive Letter W word list and found many W’s around the classroom. 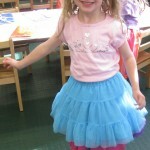 Now that it is Springtime, the birthday parties just keep coming! With three (just this week) the students were goodied and goody-bagged nearly all week long! Seeing that it was Letter W Week, the teachers decided that Wednesday Was Way too important of a day to just be an ordinary day. Hence, WaCkY WeDnEsDaY! 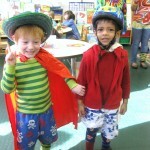 The students were encouraged to arrive to school in the WaCkIeSt outfit they could find! Everything from caped superheroes and winged fairies to mismatched shoes and even an underwear hat came to school on Wednesday. It Was WaCkIeR than anyone could have imagined! 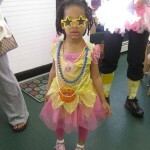 Here are some of the highlights from WaCkY WeDnEsDaY but be sure to click the link below to see the entire album. 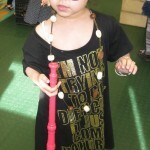 In honor of WaCkY WeDnEsDaY, the teachers created a fill-in story all about a WaCkY day at school! 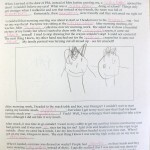 The students worked with the teachers to finish their story and then completed an illustration to match. 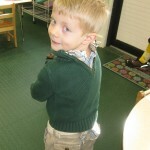 Be sure to click on the picture to enlarge it and read all about one student’s WaCkY WeDnEsDaY! 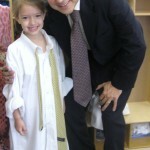 In the afternoon on Wednesday, the students began the second to last Spanish unit of the year – Los Animales (Animals). 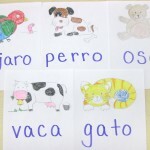 Miss Saily did a wonderful job introducing the vocabulary for the following animals – gato (cat), perro (dog), oso (bear), pajaro (bird), and vaca (cow). 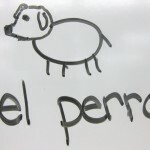 Unfortunately, Miss Jocelyn’s illustration of a dog left the students a little confused as they insisted that it was a pig. What do you think? Thursday began by discussing one of the biggest W’s that lives in the water – Whales! 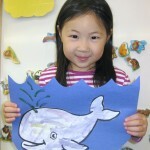 The students used watercolor paints to create a beautiful colorful whale! Taking inspiration from pictures such as this one below, the students used glitter pens to create the most fun part of the whale – the Water spouting out! These whales were not only friendly- they were happy and wet whales! After the whale projects had been completed, the teachers lead a presentation about Earth Day, which was re-named World Day in honor of Letter W week. In the video link below, the students learned about a very important W-word, Waste, and ways to reduce it! Be sure to follow the link below to learn how to do your part to keep our World nearly Waste-free! Reduce, Reuse, Recycle! In the afternoon, the students had Spanish class where they practiced the new vocabulary. Fortunately this time, the teachers left the drawing to Miss Rima so there was no confusion! Friday was a super exciting Science day. Since the theme of the week was Water, the teachers decided to pick out some of the most interesting kid-friendly water experiments to do with the students. The students did a great job hypothesizing like real scientists! To recreate this experiment at home simply fill a clear plastic liter bottle 3/4 full with water. Add blue (or any color) food coloring then add cooking oil. Leave about 1 inch at the top of the bottle. Tilting the bottle back and forth causes the wave effect. Fill a water container and try to guess which items will sink to the bottom and which will float. 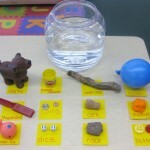 Throw in some light objects that will sink (a coin) and heavy objects that will float (a toy boat). Here are the items that we used. Take a look at the last few items that were dropped in the water tub. We saved the most interesting item for last – the empty Play-Doh container. Be sure to watch below to see what happened. Well, that’s all for letter W week. As always, we thank you for reading and see you next week!